If you live in Southern California, Christmas is time for tamales. Your sweet Mexican friends and neighbors will bring you plastic bags, filled with tasty meat fillings encased in tender corn dough. Muchas Gracias, you will say, and Feliz Navidad. Then when your friends turn their backs, you will devour your tamales, all of them. You will want more, and you might get another bagfull, but you surely will only get them in December for Christmas. But if you move away from Southern California, there's a good chance (sniffle) that no one will ever bring you a tamale again. People might even think that you should go and buy your own tamales, because they are available at every movie theatre. Ay caramba, amigos. 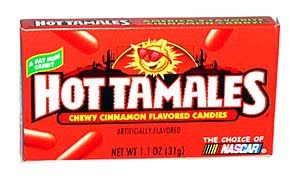 Hot tamales are good too, but not for Christmas. So you will have to resort to making your own tamales. Warning: Making tamales is messy and time-consuming. Proof: My friend Denise and I turned out a cool six dozen in my kitchen; it took all morning to make them and all afternoon to clean them up. Warning: Tamales are outrageously delicious and terribly addictive. Proof: West has eaten NOTHING but tamales since I made them-lunch, dinner, breakfast, lunch, dinner. If this keeps up, I'm going to rename him Westito and buy him a sombrero. Last year I gave you the in-depth tamale making guide. You've got to click here to get it. This year, I'm giving you the fillings. I make red chile beef, cheese and green chile, and I usually make tomatillo chicken. But this year, I used my sweet and spicy chicken and it's been the run-away favorite. Here's my new three favorite fillings below, and if you give up before you get them made into tamales, they make super-fantastic tacos, too. Feliz Navidad, either way. Place everything in the crockpot and cook on high for about three hours. Shred with fork. Season to taste with salt and pepper. Chicken will absorb extra juices when shredded. Place all ingredients in crock pot on high for about 5 hours. Shred with fork and carefully discard fat. Season to taste with salt and pepper. My friend Denise brought over some cans and we made some tamales in there too. Haven't steamed them yet, but I'm anxious to find out how they turn out. I'm laughing because you said that you had enough tamales to last you for a while and all of mine are gone...well, I do have the cans left. I'm going to make some more so I can steam them all together. I live in Idaho and two days ago, some people came to my front door selling tamales. They looked like they needed Christmas money, so I bought a dozen. They were good, but too much corn, not enough filling, I would love to learn to make my own! Thanks for the recipes! Do I dare try my hand at these tamales? A friend of my mom's in LA sells tamales every year at Christmas and I think our family usually orders about 75,000 or so. They are ridiculous. At least one member of the family is sitting with a plate full of them at any given time from Christmas to New Year's. They are the best! One more reason I wish I was in CA this Christmas. So, am I brave enough to give it a go? My mind says no way, but my taste buds are begging my brain to go for it. We'll see? Almost thou convincest me! Actually, I really think I'll do it. My father-in-law is from Southern California. Maybe he'd appreciate some tamales this Christmas. Everyone's coming tomorrow. I could tuck the kids in bed and make these all night...? How funny - Westito and buy him a sombrero. We went to our favorite Mexican resturant last week and the tamales stunk. I thought then that I needed to learn how to make them. It's neat learning about all the different traditions for XMAS from everyone. Prudy, tamales are as big of a deal in SA as in Socal. I could have sent you some!! I love your tamale recipe. I made a quadruple batch last Christmas to rave reviews, and the process was so much simpler (and tastier) than the complicated one I'd been using previously (i.e., cooking up whole chickens, pork butts, skimming fat, etc.). I started making tamales on a whim 5 or so years ago, and the tradition has stuck. I highly recommend this recipe -- thank you! Thank you so much! I remember when you made a quadruple batch last year and were kind enough to leave me a nice comment. I really appreciate it. I can't tell you what it means to me to have my recipes out there being enjoyed by others. Merry Christmas. Your recipe has forever tainted me forever. I can't eat any other kind. I love love love these tamales (the cheese ones), but because my hands are full I may have to settle for your tamale griddle cakes, which I also love. i was JUST lamenting to jared that he needs some mexican patients so that someone will bring us tamales for christmas. in an act of faith (or rebellion) i put them on my menu this week, but i'll confess that i have no desire to put in the elbow grease on tamales during the week of christmas. i am mostly glad we left southern cal, but i do miss getting tamales, REAL tamales. sigh. Your tamales look so delicious! I wish I was up to making them this year. But with Little Laidey sick, I'm not making much of anything. I will definitely be making your tamale griddle cakes though. I love that photo of the lone tamal (singular of "tamales") with the salsa on top. YUM! I've been aching to make my own tamales, but I need a steamer! I'll be getting one soon, though. Tamales steamed in cans? Brilliant! I would seriously love to do this one year. I don't think I've ever had a homemade tamale. My husband is from Mexico and making tamales is a Christmas tradition of ours, too. I usually use a rotisserie chicken with added spices for filling, but I plan to try your sweet & spicy recipe. Thanks for sharing! I so want to try this but I don't think with the croud I have coming I should do something new. Maybe new years...BTW made the fudge again this year soo goood. Have a happy chrsitmas!! I may have to do the for New Years. We'll see if I'm brave enough! Oh, Prudy, Prudy....I am a San Diego transplant to this frozen tundra of SLC. My sisters and I make tamales every year for New Years. I suggested we try your recipe. NOOOO they said. I did yours anyway myself. Can I just tell you.....HANDS down the best tamales we have ever tasted. I am a big fan of Trader Joes green chili and cheese tamales (do they even make those anymore? ), these were every bit as good maybe BETTER! Thank you for supplying our new go to tamale recipe (and NO LARD! )....YAHOO!